The second edition of FormaliSE was held on Tuesday 3 June 2014 in Hyderabad (India), co-located with ICSE 2014. 32 Participants heard an inspiring keynote by Aditya Nori (Microsoft Research, India), followed by presentations of scientific papers, including discussions. A “round table” session, chaired by Nico Plat and Stefania Gnesi, concluded the workshop. Eight scientific papers were accepted from 21 submissions that were reviewed by an international programme committee (40% acceptance rate). Each paper was reviewed by 3 PC members and the average rating was high compared to normal standards. Topics ranged from integration aspects of formal methods, to verification and to cyber physical systems. 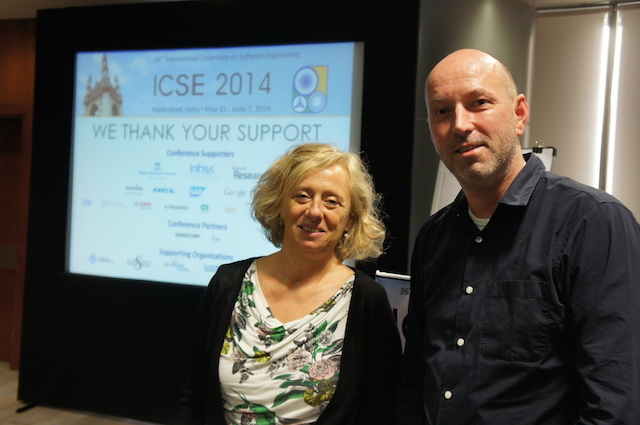 The proceedings of the workshop were published as part of the ICSE 2014 proceedings. A table of contents including brief abstracts can be found here. 10:00-10:30: Session 1: "Integration of Formal Methods in Software Engineering"
11:00-12:30: Session 2: "Integration of Formal Methods in Software Engineering (continued)"
14:00-15:30: Session 3: "Analysis and Verification"
16:00-16:30: Session 4: "Cyber Physical Systems"
Local organization was provided by Ravindra Metta (Tata Consultancy Services, India).